Detroit’s seemingly endless grid-patterned suburbs spread mainly west of town, and the northern half of this suburban cluster has been split off of the formerly singular Detroit metro area. That northern half consists of the relatively new and prosperous suburbs spreading north into Oakland County, including not only the named places of Warren, Troy and Farmington Hills but also such familiar names as Southfield, Pontiac, Royal Oak, Auburn Hills and Bloomfield. These suburbs, located on once-agricultural land, are plain, business friendly and mostly family friendly. Troy has become a major business and commercial center, with a number of plants and headquarters operations. Many of the firms making a home there are well known in the automotive industry – Altain Engineering, Budd Company, Delphi, SAE International. Temporary employer Kelly Services and a couple of banks also call Troy home. The area suffered a bit of a blow with the bankruptcy of locally-headquartered Kmart, and much of that operation has been moved, through merger, to Chicago. Like most of Detroit, and Michigan at large, the area is vulnerable to economic cycles. Troy and the other suburbs are mostly modern, with large commercial concrete and glass structures and attractive if plain housing. The area is known for its community feel and strength of community sports programs. Warren is similar, and goes to market with the slogan “Small Town Lifestyle, Big City Commerce.” Warren is home to the General Motors Technical Center and a series of US Army technical and research facilities among other installations. A number of Detroit suburbs are known for their lack of diversity; Warren is one of them. Finally, Farmington Hills is a mostly upscale residential suburb and shopping area with attractive housing developments spreading northward into West Bloomfield. For the most part these northern suburbs feature a strong community framework, modern amenities, and a comfortable if not showy suburban lifestyle. Detroit itself, naturally, provides many city amenities and services not available locally. Main roads, laid out on a grid, make getting around fairly easy; while the area is spread out, traffic isn’t much of an issue. Most work somewhere in the area; relatively few commute to Detroit. The airport is on the southwest side, a long drive around the I696-275 beltway Large areas of outdoor recreation lie to the north and especially to the north of Saginaw Bay or east at Lake St. Clair. Cost of living is a moderate 92.9 and homes, averaging $177,500, are good values for the money. The Buying Power Index, our measure of incomes relative to costs, one of the strongest in the U.S. But climate and a dubious economy also affect the ranking. Detroit’s northern suburbs occupy mainly flat to gently rolling agricultural terrain in the glacial plain spreading north into the state. The continental climate is variable and rigorous, influenced by location on storm tracks and lakes Huron and St Clair. Winter storms can bring combinations of rain, snow, freezing rain, and sleet with the possibility of heavy snowfall. In summer, most storms pass to the north allowing for intervals of warm, humid, sunny skies, and occasional thunderstorms followed by days of mild, dry, and fair weather. Lake and northerly breezes cool the area occasionally. Summer temperatures reach 90 degrees F or higher. Winter lake effects produce considerable cloudiness but also moderate cold temperatures. First freeze is late October, last is late April. The median home price in Grosse Pointe Park is $368,000. Browse Homes in this Range. 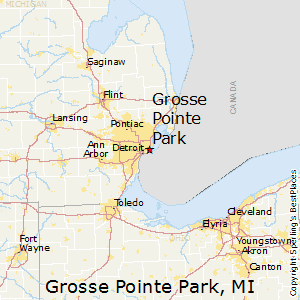 Compare Grosse Pointe Park, Michigan to any other place in the USA.